Transform your legacy system, Terminal Emulator ‘green screens’, into easy-to-use, graphical screens with no changes to the underlying application. StayLinked’s SmartTE delivers the speed and reliability of traditional Terminal Emulation with the intuitive, modern user experience of a web-based application. For decades Terminal Emulators have been fast, reliable, and secure. More than 70% of data collection devices in warehouses run wireless Terminal Emulators to connect with mission-critical, server-based applications. However, there are great productivity improvements to be had by implementing an easy-to-use, graphical data collection application that supports modern, touchscreen devices. With StayLinked SmartTE you get the best of both worlds with No-Risk Application Modernization. 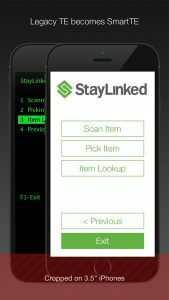 StayLinked TE provides the speed, reliability, and security of a traditional Terminal Emulator while increasing productivity and usability with the addition of an intuitive, modern user experience. As systems like Android or iOS are implemented across the industry landscape, there is a need to take full advantage of these mobile devices. With SmartTE, existing “green screen” application can be transformed to look and act like native applications on these modern OS devices. With the Dynamic Screen Generation option, there are no changes to the original application and no programming skills are required. SmartTE features are offered as a free upgrade to existing StayLinked customers with an active maintenance and support contract.